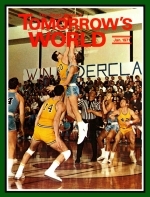 How MANY of our readers, I wonder, would realize that a basketball game, as illustrated on our cover of this number of TOMORROW'S WORLD, could be an important part of EDUCATION? Before you draw conclusions — wait a minute! Let me give you some FACTS I'm sure you don't know. All colleges — at least, certainly, nearly all — have basketball teams. And do they consider basketball games a part of the EDUCATIONAL function of the college or university? Probably not. They don't rate any academic credits. But this gives me an opportunity to explain another way in which AMBASSADOR Colleges are different! Yes, and so refreshingly different! So delightfully different! Through the basketball season, we have been having doubleheader basketball games on either Saturday nights, Sunday afternoons or Wednesday evenings, in our gymnasium. The gymnasium itself is a part of the Physical Education Facility — and absolutely the most beautiful building of its kind we have ever seen. The gym is not a giant basketball pavilion, like those of some of the major universities, with seating capacity for spectators of from 7,000 to 15,000. But our gym does have bleachers on each side of the basketball court which fold out or telescope back against the walls. They will seat about 1,500. Let me explain what would be the probable reaction of a student or basketball player from some other college or university. First, he would be struck with the beauty and the character of the building itself. Even the entrance lobby is carpeted. He might look for the ticket-selling window — and be a little bit flabbergasted because there is none! Think of it! College basketball games — and NO ADMISSION PRICE! He would find smiling, uniformed student ushers showing him to a seat. Our visitor would hear the music of a really good band. And, entering the gymnasium, he would see about a twenty-five-piece band, all decked out in striped red and white jackets. He would see the two officials waiting for the game to start, with their official-looking black-and-white-striped shirts — just as in any college, university, or pro game. The two teams would be warming up, throwing practice baskets at their respective ends — each team in different colored uniforms — or it might be the Faculty team at one end, with their white uniforms with purple and gold trim and numbers. Then would follow the introduction of the respective starting players of each team — just as in any other college game. And then, from the announcer: "And now will you all rise and join the band in singing the national anthem." This is followed by applause and some yelling, as the two teams go to the floor, and one of the officials takes his stance to toss up the ball between the two centers, starting the game. The electric scoreboards — one at each end — are set at 20 minutes for the first half, and as the ball is put in play, the seconds begin whipping past in bright red colors, indicating the amount of time yet to be played. Our visitor might be a little surprised to see the caliber of play, the poise and accuracy of the players, as they begin scoring baskets smoothly and accurately in spite of alert, vigorous and tight defense — both teams playing a torrid fast-break game. He might be quite surprised to see the scores building up as rapidly as in a big-university game. All just like any other college? Well, NOT EXACTLY! Our visitor would begin to notice several differences! He would begin to be aware that he was not sitting in a cloud of cigarette and cigar smoke, but in fresh, clean, pure air kept fresh by the air-conditioning system. Then he might be quite amused — if not shocked. He would see in the stands, not only students, some in "rooting" sections, but many whole families, including the kiddies and even babies. "MAN!" he might exclaim, "I never saw anything like that before." Most of those with babies or little children would leave after the early 7 o'clock game, to put the kiddies to bed. As the game would progress, he would be amazed to see that while the play is fast, aggressive, and determined, there is no deliberate or intentional fouling. Of course, unintended and accidental infractions of some of the rules are bound to occur. But when they do, the one who fouls will usually raise up his arm almost before the official blows his whistle. And — surprise of surprises!! — he NEVER sees a player get angry at an official, or make any complaint whatsoever! At each end he would see a group of girl rooters, dressed in the colors of their team's uniforms — standing on the sidelines. If one of the Freshman team is fouled, the Freshman girl rooters will shout in unison: "Sink it, Al, sink it!" But the absolute payoff would come when one of the Faculty team gets fouled. The girls rooting for the Faculty would shout in unison: "Sink it, Mr. Petty, sink it!" Who ever heard rooters call the player they root for by the title, "Mister"? But our girls do- when the FACULTY is playing — but, of course, never for the STUDENT players. Really, the first time I heard this, myself, I laughed myself hoarse — almost. Sometimes my son gets fouled, and as he goes to the line, the girls yell: "Sink it, Mr. Armstrong, sink it!" The students show genuine respect to the Faculty. When a time-out is called, of course, the band strikes up a lively tune or a rapid march, and the girl rooters on the floor do some maneuvers to the rhythm of the music. But now for the REAL POINT! We do not play intercollegiate basketball at Ambassador, but instead intramural games. There are four teams of the four general classes, and a Faculty team. There also are a few girl teams, playing by girls' rules, of course. We do not give academic credits for basketball, of course. Yet this definitely is a part in the students' EDUCATION — the way it is played at Ambassador. Our present Director of Physical Education, who was a star college player, will tell you that any one of our teams would win its quota of games should we enter one of the minor college leagues. Basketball at Ambassador is a CHARACTER BUILDING activity. Our men are taught to play hard and to develop skill, but without overdoing it, or devoting too much time to it. Life at Ambassador must be BALANCED, and time must be budgeted. This activity must not take time needed for study. But by making the most of every minute, there is ample time to develop basketball proficiency without WASTING time. Ambassador is a CHARACTER-BUILDING institution and, at this college, basketball is used to BUILD CHARACTER. I have always taught our students that whatever they do should be done WELL — the very best they can. They play hard — they put their whole energies into it. They try to be both fast and quick — there's a difference. But they try to avoid roughness of a type that might harm or injure other players. I have actually seen our players raise their arms, and tell the officials they had fouled an opponent — unintentionally — when the officials had failed to see it. But NEVER have I seen a player gripe, or complain in any way when an official calls a foul against him — even if the official made a mistake. It is the BEST of good sportsmanship. When the game is over, losers will shake hands with and congratulate the victors with enthusiasm and with smiles! Sure, they play to WIN, but they expect the other team to try to win, too. Basketball is good, clean recreation — played the Ambassador way — and they realize that coming off with the biggest score is not the most important thing. If they lose, they simply try harder next time; but they have BIGGER GOALS than winning a ball game. These games are mere RECREATION, not the goal of life. One of these games is a delightful CHANGE from the other activities of the day. I am nearly always in attendance when I am in Pasadena. I think it encourages the students to see me take an interest. WHATEVER we do, here at Ambassador, we try to do it in a manner to develop wholesome and right character, based on the laws of God — and in a manner to live, always, by EVERY WORD OF GOD! Basketball, of course, is only a small part of the uses and activities for which the Physical Education Building is used. During the five school days of each week, it is in use all day long with physical-fitness classes, one following another — one hour for each class. Students are put through a series of calisthenic exercises and taught physical skills during each hour, for the development of better health. The gymnasium is also used for weekly forums for one hour each Tuesday, and student assemblies for one hour each Thursday, attended by the entire student body and faculty. The assemblies are usually educational. Then there are also student devotional assemblies held at other times. In the full-college-size 6-lane swimming pool, some students take swimming lessons, others who are good swimmers have water-polo games. This facility was the first unit to be completed in our campus-expansion program, and it serves a tremendous need — in use constantly every day. And it is only one more example of the fact that emphasis at Ambassador is on recapturing the TRUE VALUES — and building right CHARACTER!